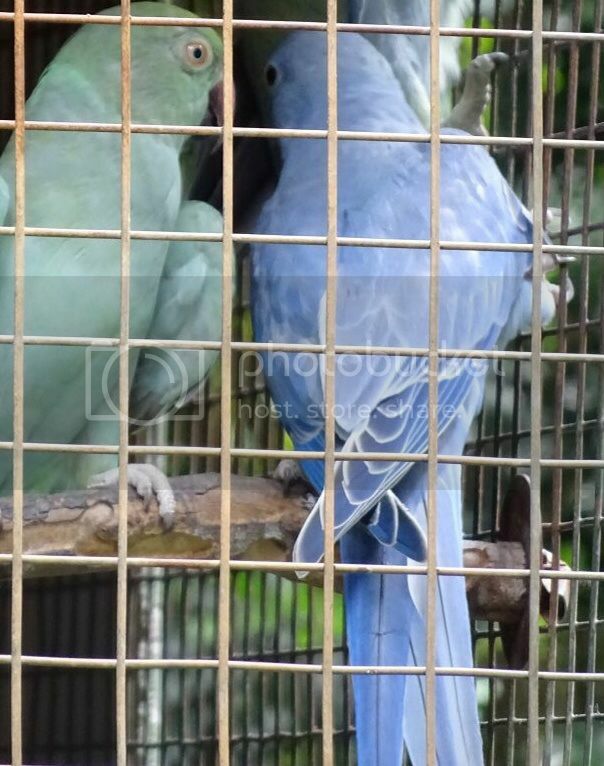 Topic: Can (turquoise/emerald) Parblue ever be a Dominant Mutation? Allair...do you happen to have a pic of the mom? You said she was a rainbow, which I believe is a turquoise pallid. Could she possibly be an indigo or emerald pallid? I'm interested to see the outcome of your photos. Lee...can you refresh my memory on the ages of the above pictured Alex's? Paul...I would be interested to see your light violet hen. I have a first generation violet hen from the original violets produced here in America. But an interesting thing happened to the color of the offspring over the years when combined with a certain blue line we have in Hawaii. Can I join in this one. I want to test myself. In pic 1 I see a slight lightening if the tail and flights and a slight darkening of the head. Light feet? Pic 2 is a bit more challenging, and the only thing I can pick out is the scalloping effect across the back. Recio...tail in top left corner. Topic: Another Puzzle...What am I? Re: Another Puzzle...What am I? I am currently tracing the family tree back. Since I still have this hens parents and their parents, I'm working to get all my ducks in a row before I post all the info. Thanks again to everyone who shared their thoughts and experience. Topic: Green baby suddenly scared of me ? Re: Green baby suddenly scared of me ? can you possibly provide me with an example, for my own visual reference, of a df and sf indigo? Because everyone's color perception is different, a visual would give me a much better concept of what you are describing. Excellent information! Thank you so much. This girl will be paired up with a blue next year. Looking forward to the results. John, I would have agreed with you a couple of weeks ago, but I have my doubts now. Here is the mom w/ the clutch mate I already showed you guys. Wow...nobody brave enough to offer an opinion? I will reveal the parents in time. I've given all the clues necessary for an educated guess at least. Thank you Ben for your response. Cobalt is a factor, but not slaty. Interesting Lee...But....can not be df violet based on the parents. Does anyone else have any thoughts they'd like to share? The spangle pattern is very similar to what occurs naturally in malabars, moustache, Derbyans, and the Philippine blue nape. I looked around too...such contradicting info lol. I found one website that listed Ti Plant as toxic too...my birds and all the local ones around here eat it too. maybe it's toxicity is regional. MissK...monstera is on the safe list. It's in the philodendron family. Any news on the eggs hatching? Most likely after the hen lays the first egg she won't let the male breed her again so by the time the fourth egg makes its way down there is nothing to fertilize it. Thank you for all the scrapes you've gotten us out of Ellie...you've always been the voice of reason. life always seems to sneak up on us doesn't it? Good luck with all that you have going on. You may be able to get away with just misting it every couple of days and water once a week. I have one pony that was the size of a walnut when I got it. It was so pathetic looking lol. Now ithree years later it's the size of a coconut. I'll send you some pics tomorrow by email. Looks great!! I have that variety as well as a few others. And spider plants all over lol...they love the new baby off shoots just be careful not to water the dracaena too much. Did you mix the dirt with mulch or pebbles? Topic: Where is Sapphire now? Re: Where is Sapphire now? Im thinking they mean cats and dogs. I keep both varieties and my cockatiels and ringnecks love the dracaena. Ill research this a bit more though because I know there are many sub species of dracaena and maybe not all are safe. Topic: Should he be weened by now? Re: Should he be weened by now? See if you can find a local breeder to mentor you. It really makes a big difference. Don't be too hard on yourself. You tried your best. I had to put one of my chicks down this morning...it's all part of nature and keeping caged birds. Please don't stress yourself about it...it's not good for that baby you're carrying. You're not a bad mummy. Peter...when they sound off their flock call at sunset it is because it is their social hour. If you listen to the birds in the park, they are their noisiest just around dusk. Interior decorating by MissK..has a nice ring to it. You can use the shell of a hard boiled egg and crush that up too for calcium. Here's a semi-off topic...whatever happened to the food contest??? Topic: You can't win 'em all. ..
Re: You can't win 'em all. ..
Skye will eat anything too. I find the females more open to eating new foods. And if the males see them eating it, most of the time they will try it too. His birdiness has "been there, done that"
He didn't even make soup?? I've seen a couple of people in the northern parts of the US reporting eggs already. It's early but not unheard of if you keep your pairs indoors. I love your bird towel!!!! Does she allow you to scratch her on the back of the head? Sometimes from scratching them and the oils in our skin, it can cause the ends of the feather to lose color giving it a brownish appearance or spotty appearance. Is that what you are referring to? What an odd duck that one...she won't even sit on it? We'll she must know something the rest of us don't. She is a good girl and that's awesome that she's vocalizing words already. It sounds so cute when they self praise...even if they're being naughty. I think the faint ring looks too "neat". Like my hens. So I'm going to say cinnamon blue pallid. Well congrats on your new to be IRN family. Glad your wife let you go through with it. You will still have all visual Lutinos out of that pair, but they will be split to blue or turquoise. Unless the male is split to blue. Then you have the chance for blue ino (albino) or turquoise ino (creamino). Skyes_crew wrote: I was thinking that too Claire. Maybe a day out in the aviary with his sibling will boost his confidence in eating. Give him a good breakfast in the morning and send him to ringneck school in the aviary. Just keep a watchful eye for any aggression from the parents towards Buddha. They should be fine...but better to be safe. They are normally good weaners...but you always meet that one stubborn one lol. I was thinking that too Claire. Maybe a day out in the aviary with his sibling will boost his confidence in eating. How thick is the formula? Try making it thick and smooth like pudding. Mix in some oat groats and millet and let the seeds soften in the mixture. Also try using organic baby food as a replacement for water when making the formula. How old is Buddha again? Topic: How to build a suspended avairy? Re: How to build a suspended avairy? I've seen guinea pigs used here...very effective. I kind of remember when hamlet started talking...well not really because I thought it was Skye doing all the talking. Turns out hamlet had learned to mimic her words perfectly. So keep a look out for who's saying what. It could be sapphire one of these days. Topic: sleep laying down ? Re: sleep laying down ? That's not really "normal" behavior for a ringneck. They usually seek the highest perch for sleeping. 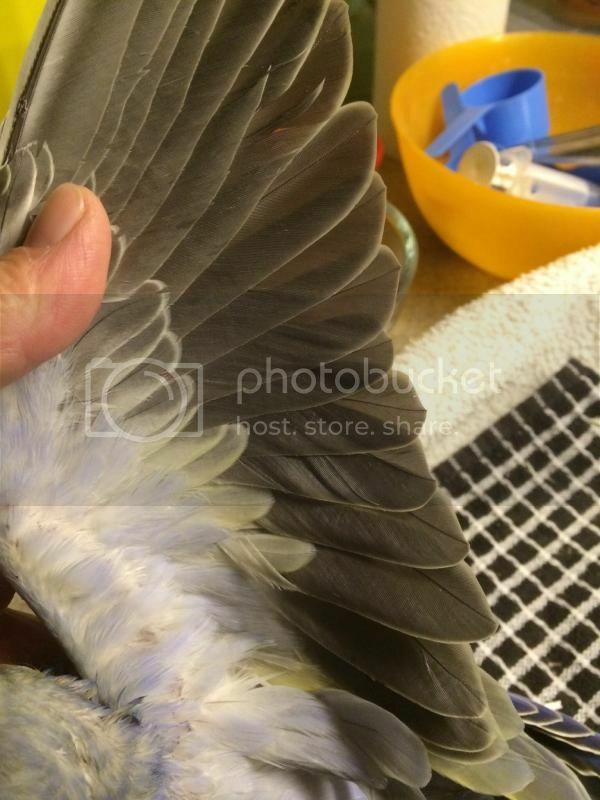 Has your bird been seen by an avian vet? Maybe it would be worth a check up just to make sure everything is ok.
Topic: Male vs. Female, which is the better talker? Re: Male vs. Female, which is the better talker? Don't believe everything you read lol. My one female is an excellent talker but only sweet when she wants to be. I agree with shey...my birds never start sitting until they're almost done laying. The eggs should come about every other day. If more than three or four days go by without another egg, she may be done laying. Is her vent area still swollen? I think Billie has given up the egg laying for now. For this year??? I have no idea. Lets wait and see what Billie has in mind. I don't think it's cruel if it saves her from laying another clutch to try to replace the one he pulls. She will try to make a nest out of any materials she finds in the cage and lay again. If the egg is only cracked but not broken open, leave it with Billie. If you do decide to order some, measure her egg and order ones as close to her size as possible. She may have tried to move it to her makeshift nest and it fell or she passed the egg while perched and it fell down. Either way, I am very glad she is doing ok.
Topic: Ceiling fans and Cookie's incident. Re: Ceiling fans and Cookie's incident. I thought I would die without my ceiling fans...but then I realized that my birds really can die with them. So I taped over all the switches. It's the safest thing with flighted birds. I hope your birdie is ok.
Peter...you can catch it...and at your age it would manifest as pneumonia. Please get Billie tested and get yourself tested as well. In the meantime wash your hands after touching anything of billies and boost your vitamin C intake. See if you can get some echinacea drops also. Good luck to you both. Sounds like another egg on the way possibly. Just keep her quiet and calm. Was the egg fully formed...not soft or dented anywhere? That looks like lots of fun...kind of wish I was a bird lol. Oh yes...food, pieces of wood, rope, and anything else they can dunk in there. Chile kisses are the worst!!! I've always used vocal commands...but I like this idea of training multiple birds at one time using colored circles. Arwen...where are you from? 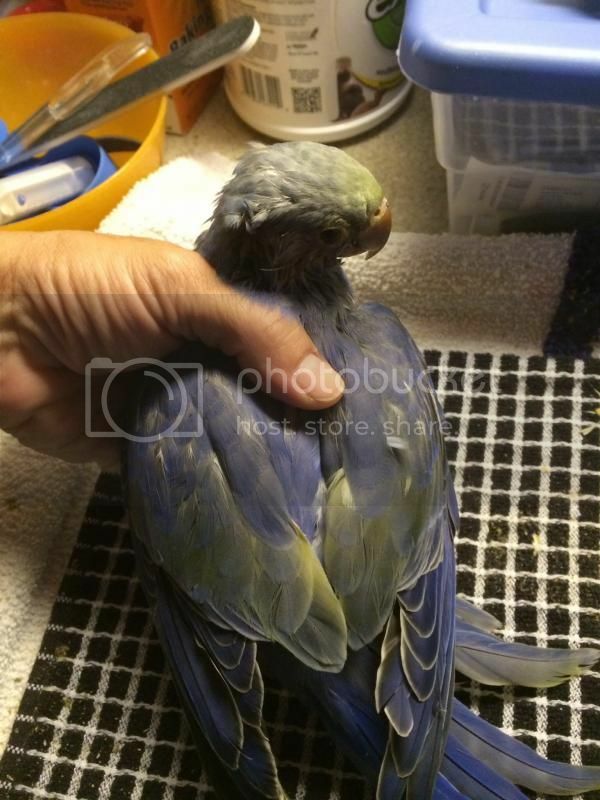 Is it possible this is a wild caught bird? I provide bathing dishes for my birds...they still dunk their heads in the water dish. I also have a bird with unexplained pink feet and light nails. He's a violet...but he was born with dark nails and they lightened. Johan has seen pics of this bird. We believe him to be /CHF. Is he ever grumpy??? Seems like he's always so laid back and happy. Ps...sorry for going off topic Tinus. How are Paulie and Chico doing? I would love to see the pirate tree...I bet that looks awesome. 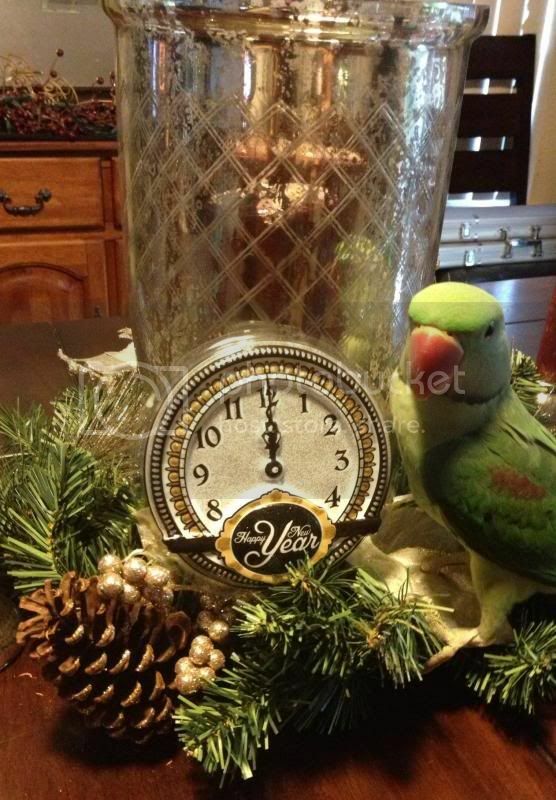 What did your birdies get for Christmas? I have yet to see one wander down this way. They have been spotted on the north shore occaisionally. I would try the hawk cry audio, but it would probably scare my other birds too lol. Good to know it kind of scared me reading about it because we have so many doves and pigeons on our island and the study I read was out of Hawaii. I fight every day to keep those darn doves away from my cages. Congratulations Lee!!! Your daughter looks positively radiant. 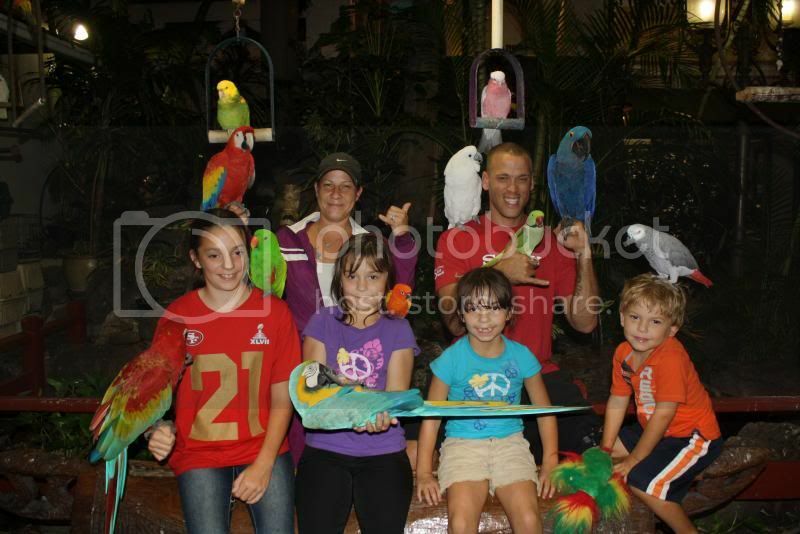 AJ...that is a hyacinth Macaw. The largest of all of the macaws...also the most expensive lol. Sorry if I'm not seeing it, but that baby in the ad looked normal to me...a little young to be sold off, but otherwise healthy looking. It could be the cage. Or it could be the approaching breeding season. Or hopefully the part missing from the nail clippers wasn't small enough that he swallowed it. It wasn't was it? My birds love these!!! They also make a bigger version in the guinea pig section at petco. Just make sure the ones you get are the plastic bells inside and not the older ball bearing style. Riccardo, the only way pet shops like that will stop existing, is when they have no suppliers. Unfortunately some breeders will sell their animals to any pet shop just to make money. I'm not sure how you should proceed as I am I the U.S. maybe molossus can give some input here. I wouldn't hesitate to call someone about the pet shop. Think about all of the other birds that may have been exposed. Topic: What is the mutation where body is blue tail is violet? Re: What is the mutation where body is blue tail is violet? Claire...I think One of bens birds has that reaction too. My violet turns a deep turquoise color. She's testing the pecking order lol. I see Nila is getting his new pretty boy tail feathers he also looks to be sporting a bit of the white part of his ring...or is it just the angle? 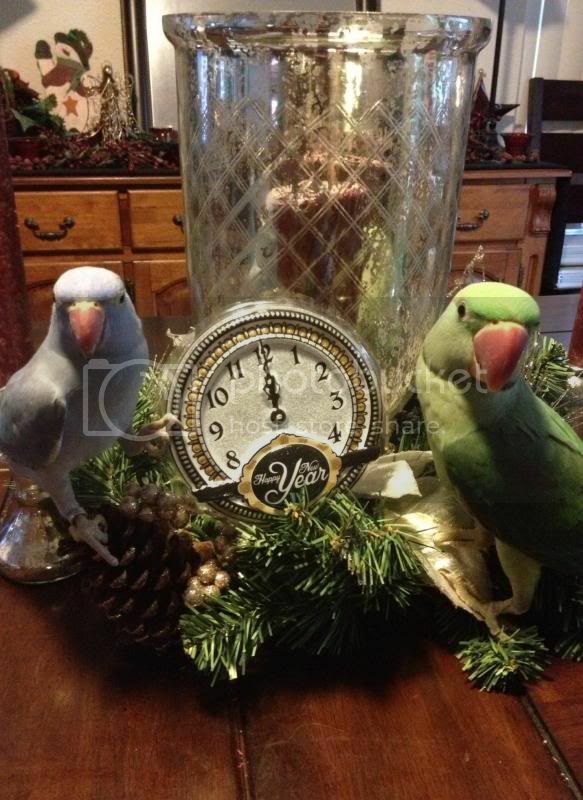 Speaking of words we don't want our parrots to learn...how often does Nila have to hear a word to repeat it??? I'm convinced they believe they are a flock. They have the freedom to move around and interact with each other at the hotel...and they do. And at home they are housed either together or nearby each other. I'm trying...is there anyway nothing can turn into something??? Re: indigo violet blue ?